This machine is trailer mounted so as to move it long-distance to any outside working site easily, and it's equipped with fully enclosed with doors and covers, easy moving like a car, waterproof, dust proof, equipped with strong hooks for lifting and packing easily. 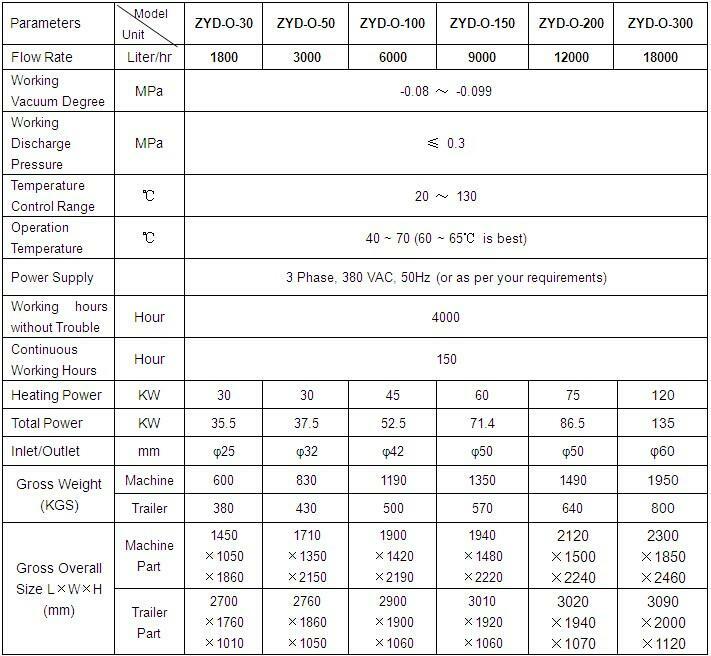 Series ZYD-O is mainly used for recovering unqualified transformer oil, switch oil, mutual inductor oil, capacitor oil, dielectric oils and so on. It adopts unique vacuum source, efficient removing free water, gas, particles and other impurities from oil, restoring oil's good condition like pure level, dry level and dielectric strength etc. The treated transformer oil can reuse again in transformer. Mobile (single-axle or double-axle trailer) type, completely closed structure, waterproof, rust proof, dust proof, move easy. Installation of car tyres, Bridge shock absorber, braking system and steel welding of entire trailer guarantee 60km/h speed. Adopts interlocked protective system, which connect oil pump, heater and liquid level sensor, avoiding blank heating, blank pumping, oil leak and electricity leak. Extend the performance and lifetime of insulating oil awfully after purification and regeneration. Comparing with the single-stage type, this machine adopts the double stages vacuum system, which can improve the machines working vacuum value highly, so it can dewater, degas and remove the impurity more deeply and effectively. The dielectric value of treated oil is higher than 75 KV. It is very suitable for the large electric & insulation equipment. Mobile type (with trailer), completely closed structure, waterproof, dust proof, it can move long distance working in field. 2. Anti-explosion (EX type) electric parts. 3. Moisture sensor with PPM displayer and dielectric strength (BDV) oil tester on the machine. 5. Stainless steel material for oil purifier body. 6. Color of the oil purifier machine.